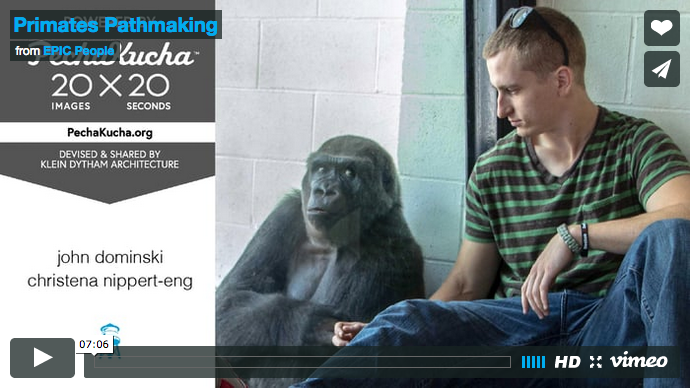 PechaKucha—This presentation explores the 3 guiding principles for research to create impact: clarity, coordination, and curiosity. Without all these elements, research struggles to make impact for the intended users. In this case, the user is Jojo, a silverback gorilla. Jojo was 80 pounds overweight, and this was caused by a number of reasons. Every solution required a clear framing of the goals, a complex and coordinated effort from everyone involved, and a genuine curiosity to engage in the solutions. John Dominski – I am a design researcher at gravitytank in Chicago, IL. I believe the purpose of research is to make impact and I practice doing this at gravitytank and as a co-author and photographer of Gorillas Up Close.